Ireland will host a Test nation for the first time in an international Twenty20 when Bangladesh arrive for a three-match series. The matches on July 18 and 20, starting at 5pm, and 21, at 4pm, will all be played at Stormont in Belfast. 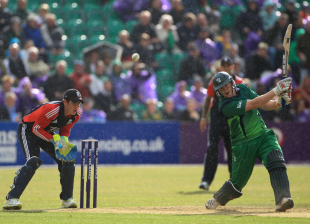 Ireland are stepping up their preparations for the World T20 in Sri Lanka in September and their coach Phil Simmons is keen to play more T20, believing his squad can find success in the shortest format. "We have a number of players ideally suited to the short form of the game," Simmons said. "There are still a few slots up for grabs and it's an ideal opportunity for the players to make a case for themselves to be included in the World T20 squad." Kevin O'Brien struck the winning runs in Ireland's victory over Bangladesh at the 2009 World T20 in England and is hoping for more success in this series. "We're currently ninth in the world rankings and a series win would help us in our quest to get extra points to get up the ICC Rankings," O'Brien said. "We've just beaten Afghanistan and we'll be looking to keep that winning momentum going. I'm sure the Irish public will flock to what is always a great evening out." Cricket Ireland have promised to lay on an extravaganza of entertainment and ticket holders for the abandoned ODI against Australia can gain free entry to one match of the series.